Fit4less - The perfect fit? Fit4less is the market-leading budget gym for everybody, offering members the opportunity to enjoy first-class fitness facilities with state-of-the art equipment from as little as €24.99 a month. This rapidly growing fitness franchise is now available in Ireland and delivered by the énergie Group – the largest provider of fitness franchises in Ireland and Europe. The good news is that you don’t have to wear a tracksuit, or take exercise classes to run a successful fitness franchise business. In fact, a fitness club franchise can offer a direct route to living life on your own terms and achieving financial security. If you want more control over your work-life balance, then a fitness club franchise can offer you an unparalleled level of freedom and flexibility. A fitness club business can be structured to suit your lifestyle, trained staff can be employed to cover every aspect of running the business, including the management of the club. This gives you complete control over your own time and the ability to work at the times that suit you. Because of the nature of the business, the gym practically runs itself, freeing up more time for you to enjoy life. This is the difference between owning a gym and running a gym. This is a management franchise where your team help your members to lose weight and get fit whilst you focus on the strategy of the business. This is why you don’t need a previous interest in health and fitness to be a success with Fit4less. The innovative technology available to Fit4less franchisees allows you to monitor the performance of your club in real time from anywhere in the world. A key benefit of the fitness club business model is the dependable monthly revenue that it generates. This is the beauty of providing a service to ‘members’ as opposed to ‘customers’. Because the vast majority of Fit4less members pay monthly by direct debit, franchisees are able to predict with almost certainty the income that their business will receive each month. The benefit of this type of continuity-based business model is that you know a certain level of income is secure for the next month, without the worry of having to rely on, or chase ‘the next big sale’ as you would in many other businesses. Additionally, members are able to join online, 24/7, meaning that new members can join your club even while you sleep! This is an added benefit of the cost-saving approach of Fit4less which saves administration time, money and resources. People always have a desire to look and feel better – it’s the reason why getting fit and losing weight is consistently voted the number one New Year’s resolution. You only need to take a look at the number of men’s and women’s magazines devoted to health, fitness and wellbeing to learn that this a huge market with an evergreen appeal. The best thing about health and fitness is that you actually have to ‘take part in it’ to get results. This is why health and fitness will never be replaced by the internet, like so many other businesses have been. The only real way for people to successfully achieve their fitness goals and produce sustainable results is through a combination of exercise and the right nutrition. When the most-convenient way for people to exercise is by joining their local Fit4less club from as little as €24.99 a month, then you have the recipe for a very successful business. The health and fitness industry has stood the test of time, despite the recent economic downturn the industry has experienced consistent growth. Recent analysis carried out by the European Health and Fitness Association reveals that: ‘Fitness penetration in European countries increases, resulting in a total of 46 million members in health and fitness clubs. The largest European fitness club operators continue to grow and investment companies strongly support their expansion’. The development is strongly driven by the growth of the low-cost, affordable fitness sector of the market. When your local Fit4less club offers first class fitness facilities, including state-of-the art fitness equipment, changing rooms and showers from as little as €24.99 a month, it’s the members who are the real winners. With a vibrant and easily accessible fitness club you’ll be providing a valuable service, that improves the health of your local community, at a price they can afford. 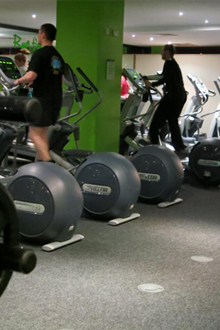 A fact backed-up by the brand’s recent success at the 2014 Members Choice Health Club Awards, where the Fit4less club in Lisburn was voted the ‘Best Budget Gym’ in Northern Ireland. The accolade is particularly significant as the Members’ Choice Health Club Awards are the only industry awards to be voted for by the people who use health club facilities on a daily basis – the members. With members receiving incredible value for money and our franchisees experiencing record-breaking sales performances, with many several months and in some cases years ahead of their business plan targets, Fit4less is a winning formula. Our members get more out of life and our franchisees do too. Take the next step towards fulfilling your business dreams and join the low-cost fitness revolution in Ireland with a Fit4less franchise, find out more today.